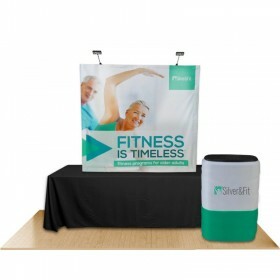 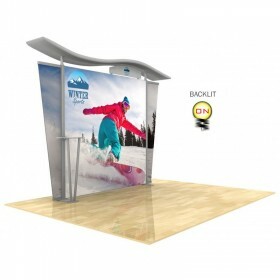 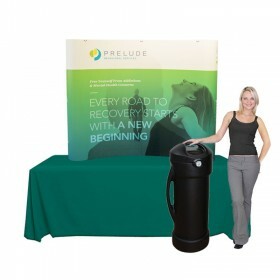 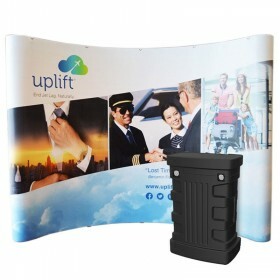 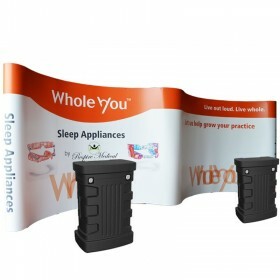 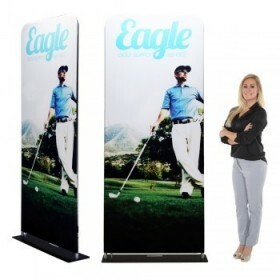 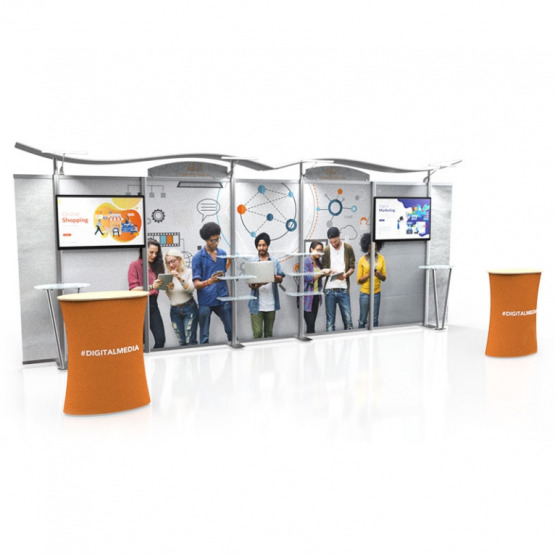 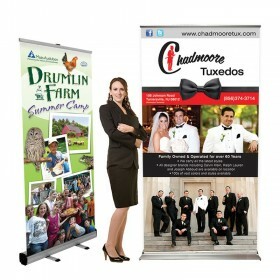 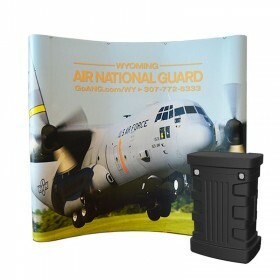 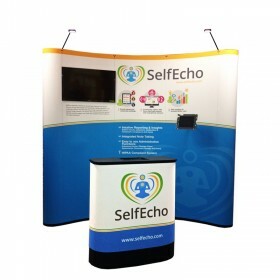 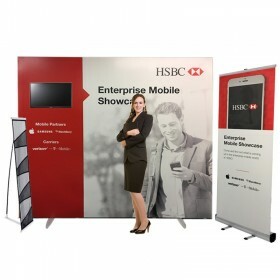 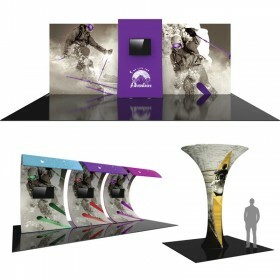 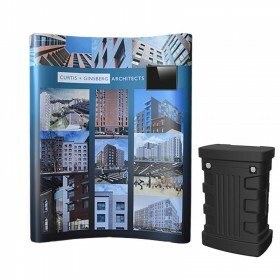 Now's the time to make a statement at your next trade show with our 20ft Timberline Hybrid display. 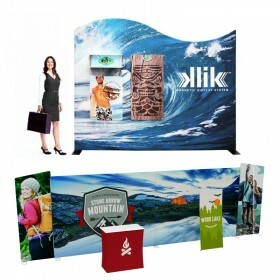 With features including a modern sleek design, eye-catching full color graphics, and "no tools" set-up, you can't go wrong with the Timberline. 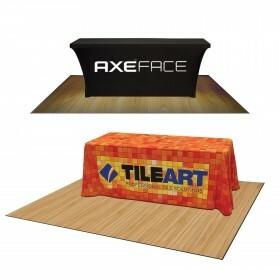 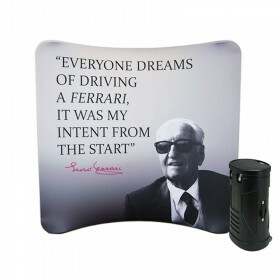 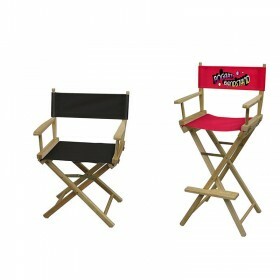 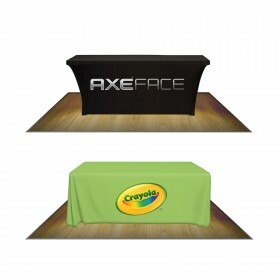 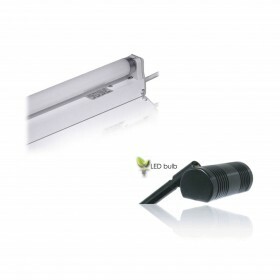 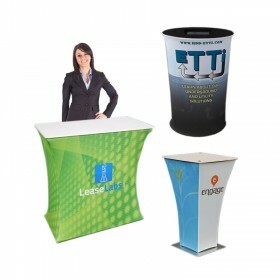 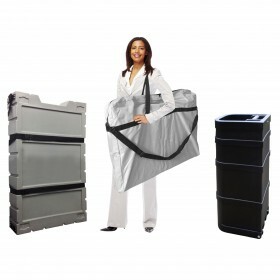 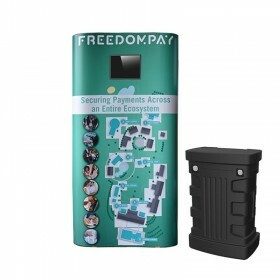 Offering a custom look without the expensive price tag, you'll be leaving a lasting impression on attendees. 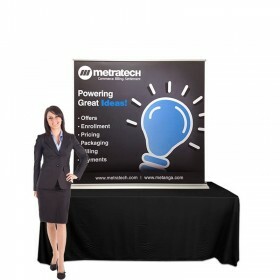 With options including LED lighting, shelving, Monitor mounts and graphic podiums you can finish off your trade show booth to make a huge statement. 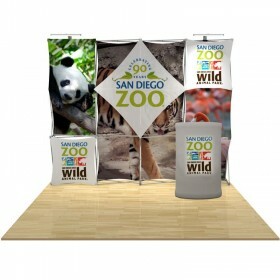 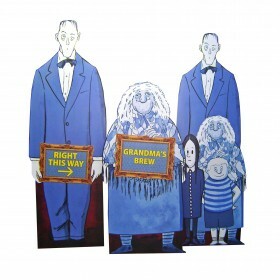 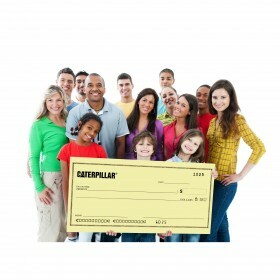 Take advantage of our in-house graphic design services to enhance your backdrop or submit your artwork file today. 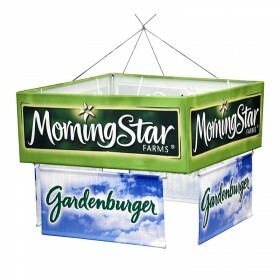 Complete package includes frame hardware, center & tapered side graphics, LED lights, arch header, wave top canopy and molded wheeled case. 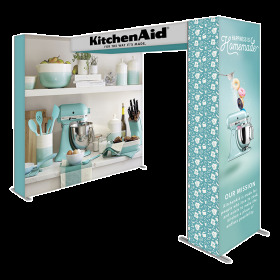 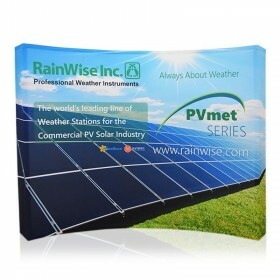 Set-up Size: 96"h x 238.5"w. **Shown with optional arch header printing. 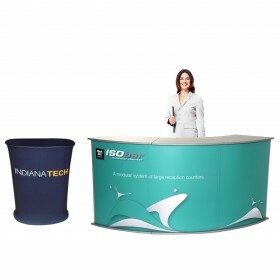 Complete package includes frame hardware, center & tapered side graphics, LED lights, arch headers, wave top canopies, acrylic reception desks & shelves and molded wheeled cases. 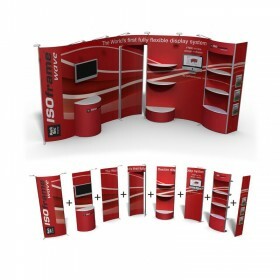 Set-up Size: 96"h x 238.5"w. **Shown with optional arch header printing. 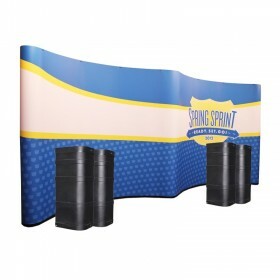 Complete package includes frame hardware, center & tapered side graphics, LED lights, arch headers, wave top canopies, acrylic shelves & reception desks, 40" graphic podiums, Large monitor mounts and molded wheeled cases. 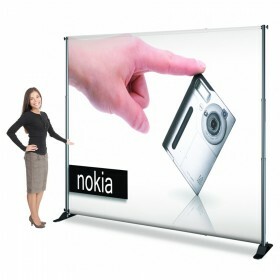 Set-up Size: 96"h x 238.5"w. *Monitor not included. 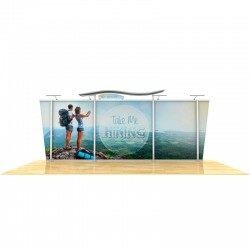 Complete package includes frame hardware, center & straight side graphics, LED lights, arch headers, wave top canopies, acrylic shelves & reception desks, Large monitor mount and molded wheeled cases. 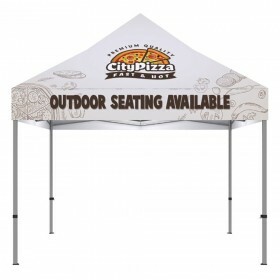 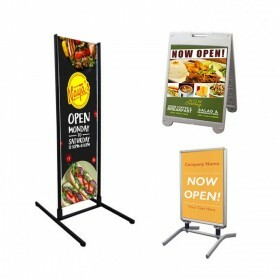 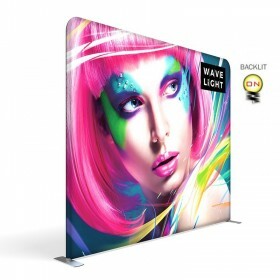 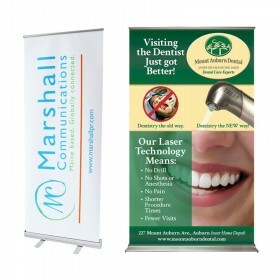 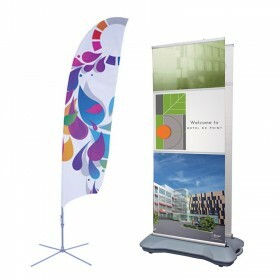 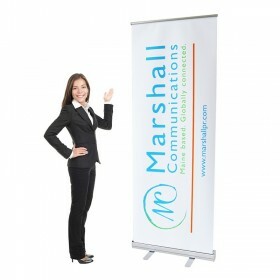 Set-up Size: 96"h x 238.5"w. *Shown with optional arch header printing. 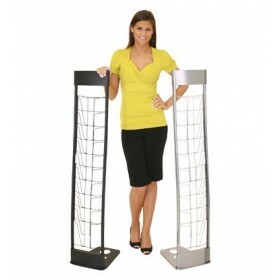 Monitor not included. 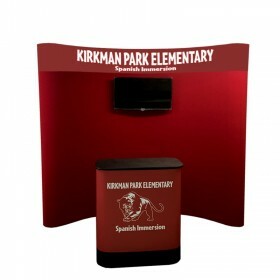 Complete package includes frame hardware, center & straight side graphics, LED lights, arch headers, wave top canopies, acrylic reception desks, maple slatwall panels, Large monitor mount and molded wheeled cases. 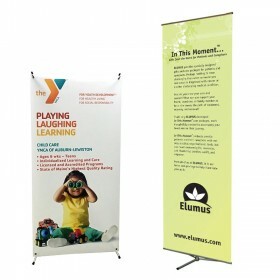 Set-up Size: 96"h x 238.5"w. *Shown with optional arch header printing. 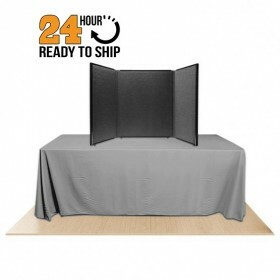 Monitor not included. 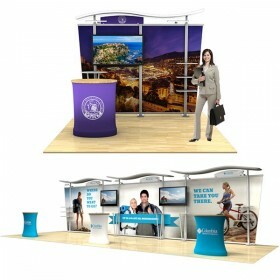 Complete package includes frame hardware, center & straight side graphics, LED lights, arch headers, wave top canopies, acrylic reception desks, maple slatwall panels, 40" graphic podiums, Large monitor mount and molded wheeled cases. 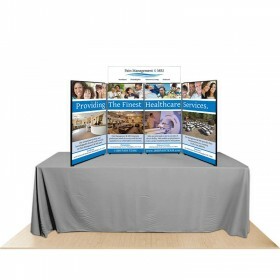 Set-up Size: 96"h x 238.5"w. *Monitor not included. 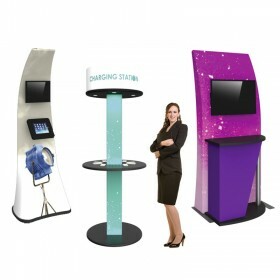 Complete package includes frame hardware, center & straight side graphics, LED lights, arch headers, wave top canopies, acrylic shelves & reception desks, 40" graphic podiums, Large monitor mounts and molded wheeled cases. 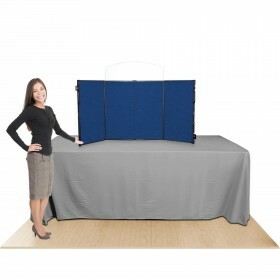 Set-up Size: 96"h x 238.5"w. *Monitor not included.